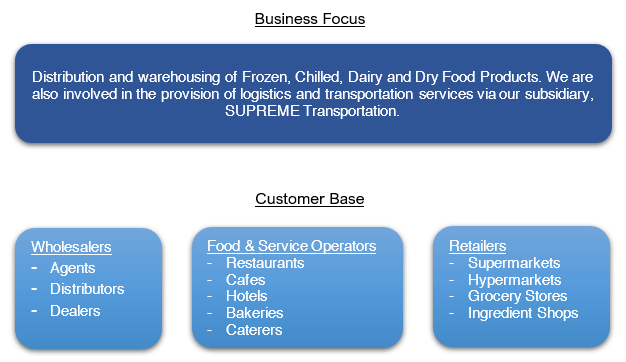 SUPREME Consolidated Resources Bhd (SUPREME) is a fully integrated Fast Moving Consumer Goods (FMCG) based company engaged in the import, trading and distribution of Frozen, Chilled, Dairy and Dry Food products in East Malaysia since 1983. Our subsidiaries are principally involved in the distribution and warehousing of third party brands as well as our own SUPREME branded products ranging from Frozen Meat (Beef, Lamb, Mutton, Poultry and Seafood), Chilled Food, Dairy Products and Dry F&B Products. We are also involved in the provision of transportation services. To be leading supplier of Frozen, Chilled, Dairy and Dry Food Products, with a comprehensive distribution network and excellent customer service within the region. To provide a wide range of quality products, excellent customer service while focusing on customer satisfaction and long term relationship with our customers.